I’ve spent the last few weeks dedicating my time to answering questions through email and on Twitter about people’s geofilter submissions. So, I’ve decided to compile a comprehensive guide of things you should know before submitting your geofilter. Rather than simply going over the Geofilter Submission Guidelines, I’m going to provide some real examples I’ve encountered or seen. Hopefully, you can learn from some them and can avoid these issues in your submission. I didn’t think it would be a problem because it’s still the general area, there’s student housing around the campus, and students cross the bridge to get to campus. But the geofilter was rejected. I resubmitted with a tightened up the geofence that just included the campus boundaries, along with the river, and it was accepted. I didn’t change anything else about my design, just the geofence. So, be sure to be precise with your boundaries. Including a couple city blocks outside of the relevant area can cause your geofilter to be rejected. Community geofilters shouldn’t cover an entire country, state or province. For On-Demand geofilters, you’re limited to 5,000,000 square feet anyway, and you’re incentivized to limit the space to save money. The way geofilters work you don’t need to cover a large area. Whether Community or On-Demand, the beauty of geofilters is finding unique opportunities and events to target to specific people. It’s not about width, it’s about depth. The geofence covered the whole island. The person explained that it was a relatively small area because it’s an island, and that they submitted one before with the same geofence and it was accepted. This can be true in some occasions, but this is especially hard when trying to pass multiple geofilters in the same area. Covering large areas are generally an exception, not the rule. So stay away from non-local geofences if you want to avoid getting rejected. But, if you feel like your geofence may work, then just realize your chances are slim. Select a public place, neighborhood, landmark, venue or other location where people are likely to gather and send Snaps. Targeting your geofilter to specific locations will help make it more likely that your geofilter will be accepted, because you won’t be competing with other geofilters. Also, people in the targeted area will be more likely to use it since it’s more relevant. You should avoid thinking this way. It’s not about it being fancy or creative; it’s about it being relevant. Make sure it’s relevant to the location and something that people will want to use. You should always look at how your geofilter meets the requirements and is interesting. Snapchat may compare your geofilter it to what already exists, but sometimes this doesn’t work in your favor. If there are many geofilters, there may be a higher quality standard for your geofilter because of supply and demand—There’s a limit to the amount of geofilters that they allow in a certain area. On the other hand, if there are no geofilters in an area, you’re setting the standard for the area. Either way, it comes down to the quality of your geofilter. After reviewing geofilters these past couple of weeks, I’ve seen a few that have been rejected and used royalty-free artwork that they didn’t create. I can’t say either way whether that’s allowed, but you should create original illustrations if possible. If not, you’re risking it being rejected and spending that same time going back and fixing it later. If you’re using royalty free artwork, take the time to make modifications to it and incorporate it into your design. I will be covering how to create original illustration and lettering in the upcoming Snapchat Filter Design course. Businesses are not eligible for Community Geofilters. You need to submit an On-Demand geofilter if you’re considering having promotional or personal content in your geofilter. The following geofilter was one that was submitted for a shopping mall. Since it’s a place of business, this is not allowed as a community geofilter. You also can’t include photos in your geofilter. However, I’ve seen others get creative with photos and use effects and filters before incorporating it into their design. Though, you can do that with On-Demand geofilters, this is less likely to work with Community Geofilters. Another one the geofilters, I reviewed faced the problem of covering up too much of the screen. Even though the word “HOPE” is transparent, this gets in the way of the photo or video, which is problem. The geofilter should always add to the Snap, not take the focus away from it. One of the most underrated fixes to your geofilter is the description you provide in the submission notes. Make sure to tell Snapchat why your geofilter is important an include any relevant dates. Also, as mentioned before, it shouldn’t be focused on the other geofilters in the area. I have seen explanations that focus to much on the other geofilters in an area, and forget to explain how their’s is important. With geofilters, the context is just as important as the design. The things you know about the location, culture, and people of the area is very important for a geofilter. So, explain why the location is special to you and why your geofilter will be useful for people in that area. These are things that Snapchat probably doesn’t know about the area, and need to know in order to make the right decision. If they don’t have that information, it’s easy for them to reject the geofilter. If you’ve followed the geofilter submission guidelines carefully, you should be good to submit your geofilter on the geofilter page. You should be fine, but don’t be discouraged if it’s turned down. Just go over the guidelines again and see if there are any areas your can improve. 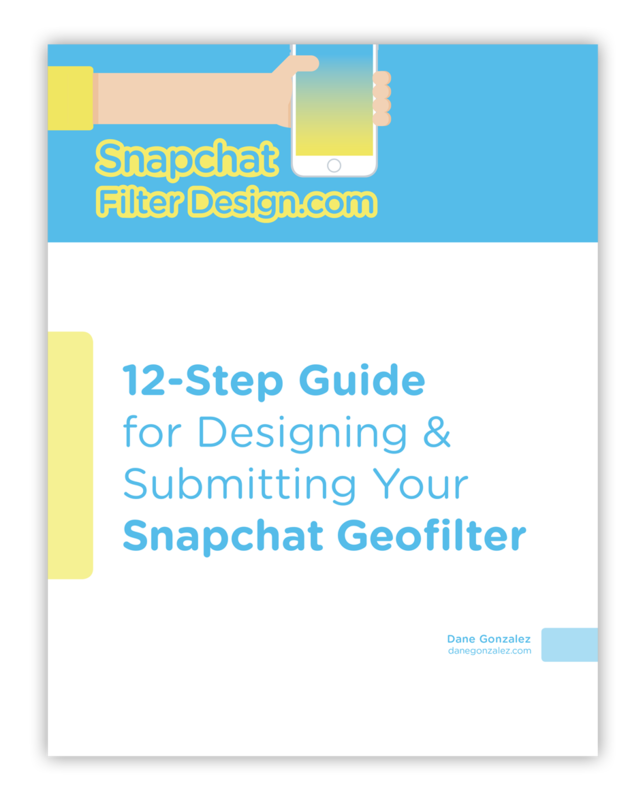 Get the Free Geofilter Design Guide! Success! Now check your email to confirm your subscription. Be sure to check your spam folder if you don't see the email.